Yesterday, I pointed out that a study by one of the leading economic modeling companies shows that military spending increases unemployment and decreases economic growth. 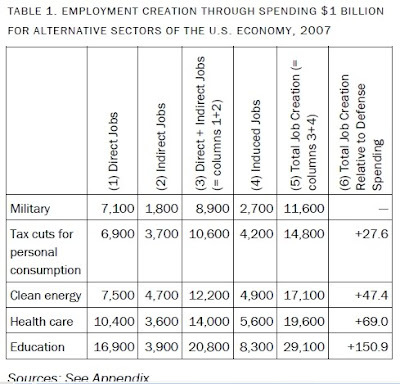 We present in Table 1 our estimate of the relative effects of spending $1 billion on alternative uses, including military spending, health care, education, mass transit, and construction for home weatherization and infrastructure repair. The table first shows in column 1 the data on the total number of jobs created by $1 billion in spending for alternative end uses. 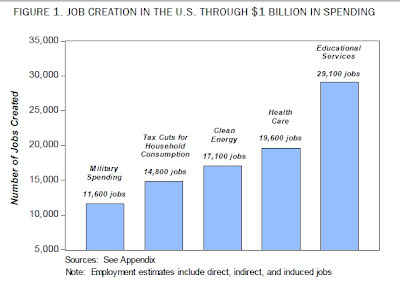 As we see, defense spending creates 8,555 total jobs with $1 billion in spending. This is the fewest number of jobs of any of the alternative uses that we present. Thus, personal consumption generates 10,779 jobs, 26.2 percent more than defense, health care generates 12,883 jobs, education generates 17,687, mass transit is at 19,795, and construction for weatherization/infrastructure is 12,804. From this list we see that with two of the categories, education and mass transit, the total number of jobs created with $1 billion in spending is more than twice as many as with defense. "Military Keynesianism" - the idea that war is the best economic stimulus - is false. The authors compare the effects of a $1 billion military investment military and the same investment in clean energy, health care, education, or individual tax cuts. They show that non-military investments create a much larger number of jobs across all pay ranges. With a large share of the federal budget at stake, Pollin and Garrett-Peltier make a strong case that non-military spending priorities can create significantly greater opportunities for decent employment throughout the U.S. economy than spending the same amount of funds with the military. The question as to how many jobs are created by different forms of spending is meaningless and irrelevant, and for the following reasons. There is only ONE ultimate cost: a labor. To illustrate, the cost of any product is made up of labor, machinery, materials, etc. But the latter machinery and material costs themselves s break down into - yes, you guessed it - labor, machinery, materials, etc. Work your way back far enough and there is only one cost: labor. Thus there is a strong case for saying that it makes no difference how you spend $X - the number of jobs created will ultimately be the same. But even if the number of jobs are NOT the same the "jobs per $" argument is still irrelevant. This is beacause inflation only becomes a problem when unemployed has dropped far enough (to NAIRU to use the technical acronym). I.e. if a particular form of spending does NOT create many jobs, then it is not inflationary, which in turn means the government or FED can just print more dollars and spend them so as to create more jobs. 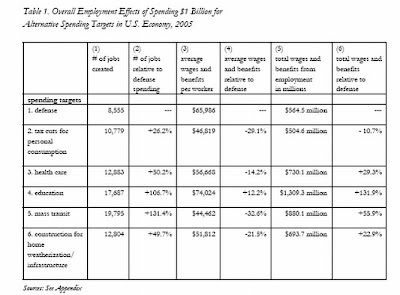 Defense gives you a multiplier of 1 for every buck you put in you get 1 buck of bang , but the jobs you get from defense spending create better paying jobs than most other spending. In this day and age that is important , too. However I'd rather see those billions spent of energy related jobs. All of you may be correct. But that's not the cultural purpose of war spending. To the tribal "conservative", all institutions in society, church, state and private property, must support the perpetuation of the tribe, meaning a system of organized conformity impressed on each generation. The good tribesmen must be rewarded by all institutions, the aberrant and radical tribesmen must be punished. Even the free market must be overridden if it interferes with this sacred mission, though that rarely happens in practice. War, in a sense, begins at home, the value of war itself to intimidate reformers into silence, to elevate men even further over women, to prize the ruling elites who supply a monopoly of military leadership and weaponry and thus deserve their privileges. War spending rewards violence and paranoia, racism, religious bigotry, economic expansion thru invasion, regimentation, manual labor and mindless obediance. All good tribal values. Welfare spending and education rewards inquiry, dissent, diversity, and insolence against traditional authority. Very modern values that threaten the identity of many Americans and their entire reason for being. And that is why many Americans would literally spend every cent in the country to buy useless weapons from "patriotic" businessmen and arm bullies, rather than let that money feed or employ a single person who is different than themselves. The businessmen easily expoit this sentiment to lobby for the Pentagon budget that suits their real purposes. How do we make the numbers of an objective study matter more to a nation of idiots than their prideful sense of entitlement to a teat on the great war pig? buyer then gets part of the profit as a kickback. This is certainly no "labor cost,"